New 1.5 inch keychain style mini digital photo frame with silver finish. This digital picture frame comes with a full color 1.5 inch CTSN screen and forward/back buttons to scroll through the photos you store onto the device. 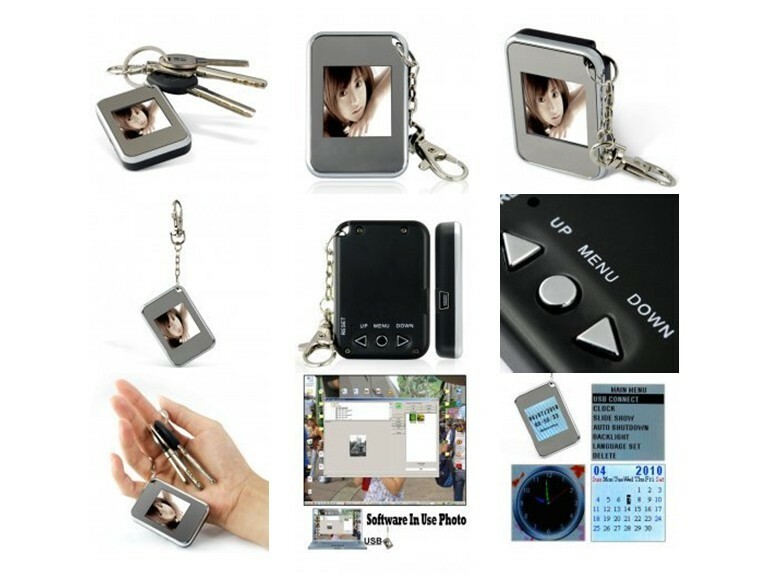 It comes with a metal keychain and its own internal software that allows you to easily transfer your favorite pictures onto it quickly and easily. The CVGB-F14 Keychain Digital Photo Frame is our best pocket sized picture frame yet! The perfect sized gadget for carrying your favorite pictures along with you wherever you go, simply transfer your pictures onto the CVGB-F14, attach it to your keychain, and now you will always have them available to look at throughout the day. This mini digital photo frame stores 143 resized photos and will take less than 10 minutes to transfer those pictures from your computer onto the device. It simply doesn’t get any easier than this! A great little gadget to add to your store’s inventory. Buy it in bulk to keep your store shelves full and to receive the absolute lowest wholesale price and shipping cost. It is available in our warehouse right now, so if you place your order today we can ship it out to you tomorrow!